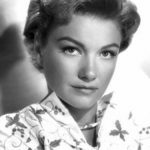 Anne Baxter was an American actress, star of Hollywood films, Broadway productions, and television series. She won an Oscar and a Golden Globe and was nominated for a Prime time Emmy. The granddaughter of Frank Lloyd Wright, Baxter studied acting with Maria Ouspenskaya and had some stage experience before making her film debut in 20 Mule Team (1940). "It’s best to have failure happen early in life. It wakes up the Phoenix bird in you so you rise from the ashes." "My grandfather Frank Lloyd Wright wore a red sash on his wedding night. That is glamour!"